When I took the checkered flag in the Kentucky 300 back on July 10th, it was my first win since my daughter, Scarlett, was born. So many emotions go through your head when you win, but Victory Lane itself can often be very anticlimactic. You want to take the time to soak in everything that just happened, but the truth is that you have obligations to take care of that sometimes make that impossible. There are media interviews, autographs to sign, pictures to take, and so on. This time was different. While I was talking to the media, I caught a glimpse of my girlfriend, Paige, holding Scarlett. From that point forward, I’m fairly certain I gave some terrible answers because I was really struggling to concentrate on the questions I was being asked. I just kind of kept glancing back over at the baby, overcome by a ton of different feelings. Less than a month earlier, Paige and I had been told that Scarlett might die. Everything started at the Quicken Loans 400 in Michigan. During the race, Scarlett was having trouble breathing, so we wound up taking her to NASCAR’s infield care center there at Michigan International Speedway. They made some suggestions and told us to monitor her, which we did. But by the time we got back to North Carolina, Scarlett was slowly getting worse. The first doctors in North Carolina thought she had something wrong with her throat, but seemed pretty confident that she would grow out of it. Well, we weren’t particularly happy with that diagnosis, especially since Scarlett had also started to become less and less interested in eating. Waiting didn’t seem right, so we decided to take her to an ear, nose and throat (ENT) specialist. After going through everything, the ENT gave Scarlett a fatal diagnosis. Eventually, she was going to stop being able to breathe and eat. She wasn’t going to make it. This was on the afternoon of Tuesday, June 16th. It’s fair to say that those hours were among the worst in my life and Paige’s. As a parent, this was pretty much your worst nightmare. We went into full freak-out mode. Not really knowing what to do, we just started contacting doctors, and eventually, got in touch with the Mayo Clinic in Minnesota, which is kind of the official hospital of a lot of people at Penske Corporation. We were able to get connected with one of their main doctors, and flew with Scarlett to Minnesota as soon as we could. Their diagnosis was this: “Oh, yeah, she’s in a lot of trouble, but she doesn’t have what those doctors said she has.” She had laryngomalacia, a weakness in the muscles of the throat that’s fairly common in infants, though it’s rarely as severe as Scarlett’s case was. They did emergency surgery on her the next day, and it saved her life. We stayed in the hospital there in Minnesota while she was recovering. On Sunday, my first Father’s Day, we took Scarlett home. Our extended family came over to see her. I kept thinking about how lucky we were that everything happened during an off week, and that Paige and I were in the same place when it all began. I thought about how lucky we were for the doctors at the Mayo Clinic, and that we had gotten there in time for the surgery. The whole thing was an incredible emotional roller coaster. 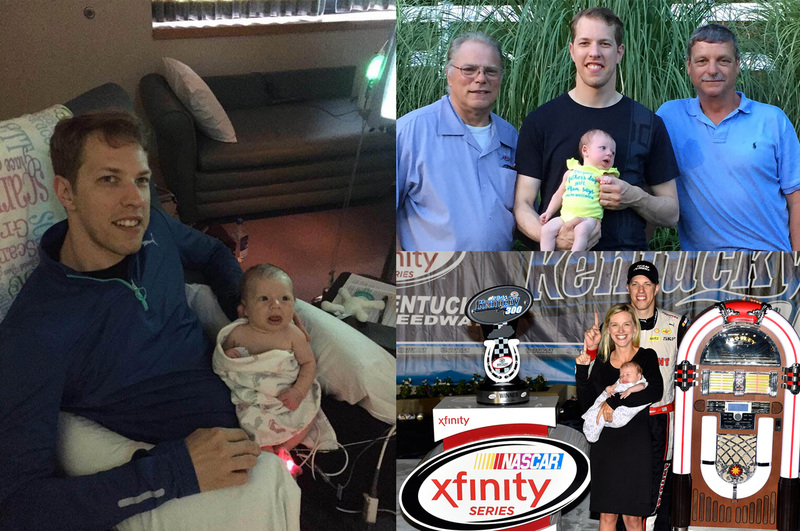 CLOCKWISE FROM LEFT: AT THE MAYO CLINIC; FATHER’S DAY; VICTORY LANE AT KENTUCKY. That afternoon, every time someone wished me a Happy Father’s Day, all I could think of was how happy and grateful I was to still have my kid. I am happy to report that Scarlett has recovered, and she’s doing well. She’s gaining weight and breathing clearly, and doing all the things she should be doing, almost as though nothing was ever wrong. For anyone out there who’s asked about her, thank you. You may not have known what was going on, but we felt the support just the same. From the moment we knew Scarlett was going to be born, I’ve had a really tough time trying to figure out how I feel about her being in the public eye. I want her to grow up and be able to make her own decisions, to be her own person in so many ways, and maybe she won’t want to be in front of the camera. Then again, I also want her to enjoy her family, and when we have significant events — like races, for example — there are going to be cameras around. I’m still torn about it, but man, was I glad to have her in Victory Lane at Kentucky that day. Reaching Victory Lane always involves overcoming some kind of adversity, and that adversity makes you appreciate the success that much more. Just winning a race on its own is hard enough. The odds are always stacked against you. But they’d never been stacked the way they were against Paige, Scarlett and me in the weeks before that race. When the media was done asking me questions, I had a short break before the next Victory Lane activity. I went over to Paige. 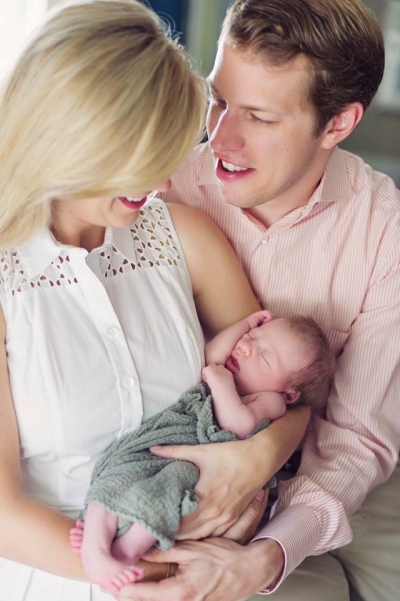 Just seeing Scarlett in her mother’s arms, smiling and healthy, was surreal and overwhelming. I’d never had my personal and professional lives come together like that. It was something else. Paige handed me the baby. All I really wanted to do was sit down next to the car, and hold Scarlett for a while. I only got a minute or so, and then it was time to move on for pictures or whatever else was next. But just being there, holding Scarlett — it was the culmination of one of the most powerful experiences of my entire life. I honestly can’t think of anything to compare it to. It felt like its own victory. It really did. GOD BLESS YOU and Family! !